As a lover of all things Japanese, originating from a childhood love of martial arts and monster movies, I am perhaps slightly biased when it comes to reviewing the latest Samurai movie. There have been quite a few good samurai movies in recent years, and tonnes of bad ones but possibly the best was Takeshi Kitano’s Zatoichi- the latest in a long line of films based on the legend of the blind samurai. With Kitano’s trademark style of soft contemplation followed by sudden quick blasts of violence and his unique and quirky take on the character, it was a big hit. With Ichi, the legend continues, albeit from a different branch on the story tree. Instead of the silent man of legend we have a vibrant young lady (perhaps having more in common with the Crimson Bat series) taking over the walking stick, continuing the recent trend of female-led sword movies- Shinobi, Shadowless Sword, even Kill Bill. Our heroine is no less deadly though and she soon cuts her way through the cast with beautiful precision. After an exiting introduction we are treated to the stunning scenery, period clothing and sets, and slow pace we would expect from this type of film. Those unfamiliar and expecting an all out action film may be soon disappointed. There is plenty of character building and story to squeeze in around the action, and there is none of the gore of Lady Snowblood, none of the fancy string-work of Hero. If you’re a fan of The Hidden Blade, Twilight Samurai etc you’ll be right at home here. Ayase’s Ichi is torn by horrible past events and she conveys both the sadness and violent eruptions of her character well, without resorting to sentiment or over the top shrieking. Takao Osawa also does well as Toma, the bumbling Samurai Ichi bumps into and travels with. The rest of the cast is fine, either bad guys there to be killed or higher grade bad guys ready to exploit. 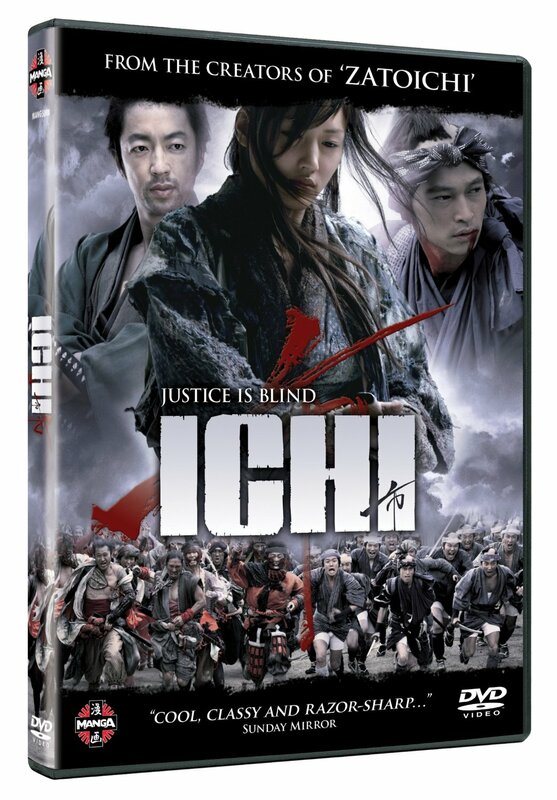 Ichi wants to find the man who trained her, but reluctantly gets drawn into a Yojimbo style war between two gangs. Can she find the man she is searching for, and will it help her move on from her past? The film lacks the high budget of some other films and doesn’t quite have the technical quality that such financial backing brings. This is largely irrelevant though as the Director makes admirable use of what he has. It is an interesting take on an age-old story and packs more of an emotional punch than more recent versions.